The Los Angeles Kings have traded goaltender Jeff Zatkoff to the Columbus Blue Jackets for future considerations. Zatkoff, 30, appeared in 13 games with Los Angeles last season, going 2-7-1 with a 2.95 goals-against average and an .879 save percentage. In 48 career NHL games, the Miami University product has posted an 18-21-4 record with a 2.72 goals-against average and a .908 save percentage. He was originally selected in the third round by the Kings in the 2006 NHL Draft and won the 2016 Stanley Cup with the Pittsburgh Penguins. Columbus assigned Zatkoff to AHL-Cleveland following the trade. Because Los Angeles signed Darcy Kuemper and Cal Petersen over the off-season, there wasn’t a regular space for Zatkoff, who backed up Petersen during Jack Campbell’s emergency recall to the Kings on December 23 but has not yet gotten into an AHL game this year. Los Angeles attempted to move Zatkoff during the preseason but was unable to do so as virtually all NHL teams had established their NHL and AHL goaltending hierarchies over the summer. “I just want to play. 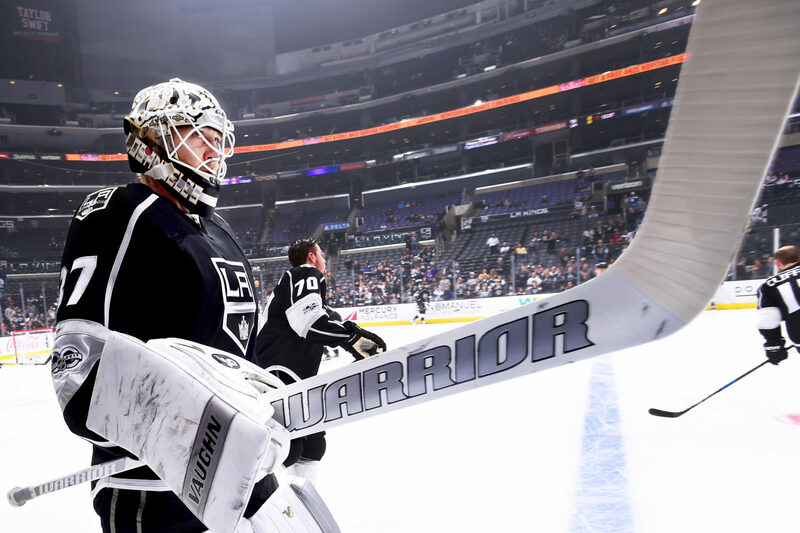 I didn’t play at all last year,” Zatkoff said in September. “I think I had eight starts and all my other games were coming in. For me, it’s just about playing. I’d want to play and I know I can play. I can play still. Like I said, last year to me was an outlier, so I just want to get back in there and prove myself, no matter where that is. Obviously we’ll wait and see how things shake out and what ends up happening here, so we’ll see what happens from an organizational standpoint. One of the many good guys in this sport! I’ve put in a word with a few Columbus sources, but on the surface, this appears to be a move made by the Blue Jackets to shore up their minor league goaltending after Joonas Korpisalo’s recall earlier this month. Cleveland, the Blue Jackets’ top affiliate, has the fewest points in the American Hockey League this season, and one reason of the team’s struggles has been inconsistent and inexperienced goaltending. Zatkoff’s presence provides another option to a Monsters group that, other than Korpisalo’s five games of AHL action, has not used a goalie with a save percentage greater than 21-year-old Matiss Kivlenieks’ .888 this season. He also provides character experience and stability in net for an AHL team that can use his veteran smarts. Because Zatkoff’s cap hit is $900K, his salary did not count towards the team’s salary cap after his AHL assignment. (A player’s cap hit, minus the NHL’s minimum salary for that season plus $375,000, counts towards the cap. This means that in 2017-18, NHL teams are not dinged for players assigned to the AHL whose cap hits are below $1,025,000.) Columbus is now responsible for paying the salary of the goaltender, who will become an unrestricted free agent should he not be signed to a new contract by July 1.